Where, oh where do I begin with this book? I bought it as a sort of bubble gum-fluffy-cutesy-quick breeze through read, and I wasn’t disappointed on that front. But my problem with this book is, was it really about all the boys she loved before? I picked up this book hoping to nostalgically reconnect with the sort of crushes my younger self used to have. Instead, I got a heaping of sisterhood. Sisterhood is great and all, and I’ve always enjoyed books on that topic, but I was not expecting that in this book. Han packaged this book to be about cute young crushes when it was really about the protagonist, Lara Jean’s relationship with her older sister and said sister’s unattainable perfection. Margot, Lara Jean’s big sister, is one of those characters who are supposed to be perfect and meticulous and fastidious and do everything correctly. I only ever got to see her through Lara Jean’s eyes, and Lara Jean basically worshiped the ground she walked for most of the book, which got really boring really fast. Lara Jean obviously idolized Margot and measured herself up against her big sister’s perfection. I didn’t particularly like Lara Jean or Margot, but I loved their little sister, Kitty. Kitty had an acerbic tongue, which I really enjoyed. She was sharp witted, a little sassy, and a breath of fresh air in a book filled with such stuffy characters. The actual romance aspect of the book was pretty predictable. 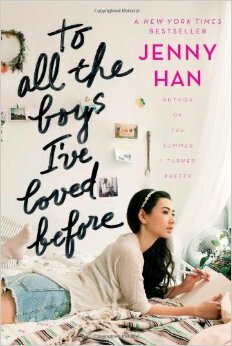 However, I did enjoy some really cute parts between Lara Jean and two of the boys she’d loved before. Those gave me what I’d been looking for: adorable, sweet, young teenage crushes. I also liked the way Han developed the relationship between Lara Jean and Peter. I noticed how she basically recycled the camaraderie between Belly and her summer boys from her Summer Trilogy but basically switched the genders to end up with Josh and his Song girls. Somehow, it worked. I don’t want to give away too much, but I’ll just tell you that if you’re looking for a fluffy bunny romance alone, you’ll be looking for a diamond in the rough. He’s beautiful. She doesn’t even know if he knows it. His eyes are so pretty, pretty, pretty, like dew drops. His smile breaks off in his face like the first light of the sun in the summer, and her heart blooms and blossoms and succumbs like the fluttery flowers in spring. She is so dreadfully, horribly, hauntingly, helplessly in love with him. And he doesn’t even know it. When their eyes meet from across the room, it’s like an electric shock to her veins, her thick blood melting; it suffocates the words in her throat, bubbling, struggling, to come out. And her brain just stops working. She loses any idea of who she is and where she is and what she’s saying when he’s looking at her, and she’s frozen in the headlights that are his eyes. She’s rendered mute, immobile. She’s tripping over her words like they’re elusive butterflies and she’s choking on nonsensities, and she can’t speak, can’t breathe, she’s so terrified. Terrified that he’ll see it. That just one look at her and she’ll melt, a buttery pastry mess all over the floor and right at his feet. But he never sees. He’ll never know. She doesn’t even want him to smile at her. If he smiles that smile at her, her eyes will widen like great big discs of I-Like-You and her tongue will be a useless flap stuck in her mouth. She curses her naivete. He’ll never love her. Too many other people love him, people smarter, and funner, and funnier, and more good looking, and more outspoken than herself. She can’t cap her feelings in a jar and translate them into words, they’ll turn into birds and flap away and desert her mouth, an empty cage. Maybe she has a thing for leader-type guys. He can handle a crowd, and when he speaks, people listen. But he’s a goofball, and he’s funny, and she’s discovered his wry, dry humor and sharp wit. Electric. Her attraction to him is electric and one day it’ll set her on fire and burn her up, burn her out, until there’s nothing left but smoke and flame and tears and regret. But that same electricity kindles her heart, that burning hope that pulsates inside her, that lovesick warmth that radiates within her, that comes from exchanging just a few words with and him giving her that smile of friendliness and respect, leaving her all gooey and syrupy and melting inside. He just has to look at her, and her heart stops, skips a beat. Her love for him is squeezing her heart painfully in its iron tight grip and it’ll never let her go. But she needs to let him go. Because he’ll never feel one ounce, one droplet, one cinder, of the all-encompassing, tumultuous, terrible, overpowering, interminable love she holds for him.